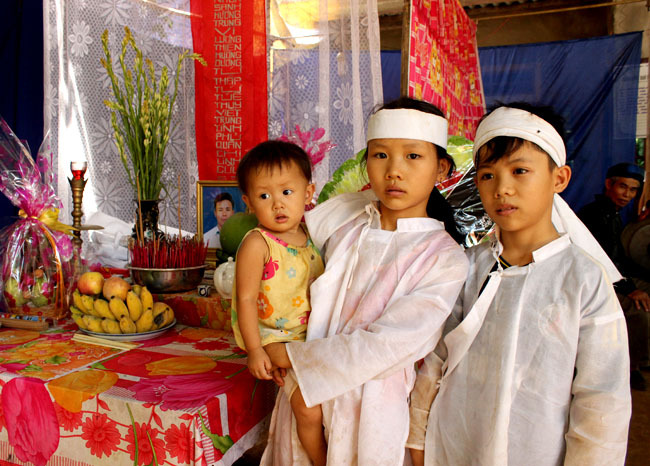 Le Huu Ha’s three children, 8-year-old Le Thi Hang at left holding 14-month-old baby sister Le Thi Thuy Trang, and their 12-year-old brother Le Huu Huy, stand by their father’s funeral altar. 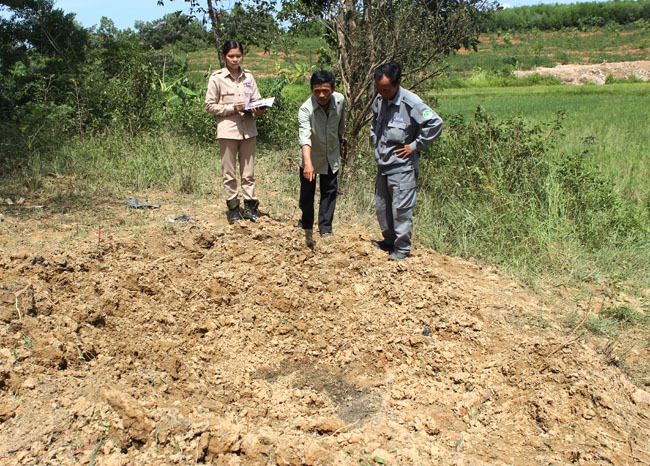 An explosion of wartime ordnance on Tuesday afternoon killed a 42-year-old farmer and father of three young children in Trung Son Commune of Gio Linh District, Quang Tri Province. The exact circumstances of the tragedy are unknown. 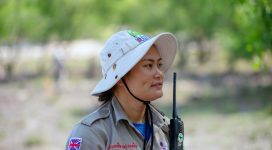 Le Huu Ha, a farmer living in Tien Kim Village (formerly known as Binh Tien) of Gio Binh Commune, died in an explosion near his family’s rubber farm Tuesday afternoon, 23 June. The location was in the area of the former DMZ or “demilitarized zone” during the war, along the Ben Hai River which divided north and south. The accident occurred on a trail leading to property owned by Mr. Le Van Chien, a neighbor, near a garden rest area with a bamboo stall and a hammock. Nearby was an excavator hired by Mr. Ha to dig holes and a water reservoir in to prepare for planting orange trees in August. The excavator was parked and idle. Mr. Nguong ran toward the explosion site and saw that the excavator’s windshield was smashed. He saw a large crater in the ground, but did not see the body of his younger neighbor. Nguong called his son and told him of the accident, asking him to inform Ha’s family. Mr. Le Thanh, whose sister was married to Ha, and other neighbors hurried to the scene. Thanh said they did not see the body because the explosion tore his brother-in-law to pieces. Family and neighbors searched all night and into the next day to collect body parts. RENEW and MAG staff are led to the accident location. Project RENEW staff and members of MAG’s Community Liaison Team arrived at the site in the afternoon and examined the accident scene. Around the explosion pit, treetops and branches were sheared off. Debris and shards of metal were scattered around. 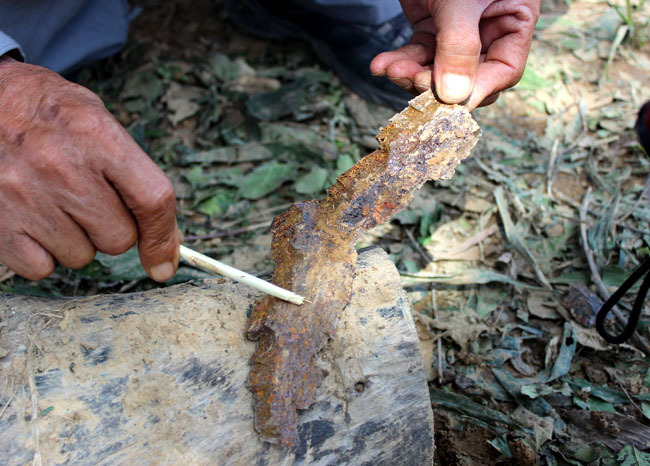 Shrapnel even cut down two of Mr. Nguong’s rubber trees more than 150 meters away. 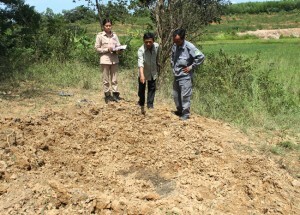 Col. Bui Trong Hong, retired military officer and National Technical Advisor for RENEW, said a 20-cm x 15mm thick fragment found at the bottom of the explosion pit confirmed that the ordnance was a type of projectile, caliber between 127 to 155mm. Col. Hong said the victim might have struck the ordnance while he was working, he might have dropped it if he had attempted to move it, a number of things could have caused the explosion. Because there were no witnesses, there is no way to know exactly what happened. A 15mm thick x 20cm long piece of shrapnel was found at the explosion pit, evidence that the explosion was caused by a projectile of 127 to 155mm caliber. 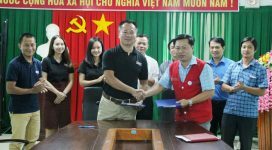 After paying respects at the funeral altar and talking with the family at home, RENEW and MAG team members met with the Gio Binh’s Commune People’s Committee to discuss the tragedy. As breadwinner for a five-member family, Mr. Ha’s death puts a terrible burden on the shoulders of his 39-year-old wife, who now must raise three young children alone. The two older children, ages 8 and 12, are grieving their father’s death. Only later will the 14-month-old baby understand the tragedy that has befallen her family. 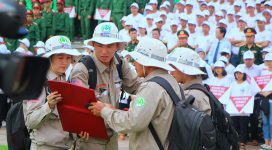 Mr. Bui Ngoc Duong, Deputy Chairman of the People’s Committee of Gio Binh, said the commune needs financial and technical support to reinforce people’s awareness about UXO risks.